The main advantage of a headrest DVD player, compared to all the other ways you can watch DVDs in a car, is that they don't take up any space. Integrated units are also extremely easy to install since they come built into replacement headrests, and portable hang-on units are even easier to use. There is also room for a tremendous amount of customization with this type of system due to the fact that a headrest DVD player can often be used by itself or in conjunction with a fully featured in-car multimedia system. While there are literally hundreds of headrest DVD players on the market, they can all be broken down into three important categories. The first type is designed to be installed into an existing headrest. That involves cutting into the headrest to create a space for the DVD player, so installing one of these units isn’t for the faint of heart. They typically come with bezels that hide the cut headrest material, which makes a seamless installation possible. The next type of headrest DVD player comes pre-installed in a replacement headrest. These units are typically available in a variety of colors, although it isn’t always possible to find a perfect match for the seat material. Most of these units are also adjustable, which allows them to be installed in a variety of different vehicles. The main issue is that while they are adjustable, most of these units don't offer 100 percent coverage. That means there is a small chance that any given headrest replacement DVD unit won't fit your seats. The last, and easiest to use, is the external, portable car headrest DVD player. These units are essentially just flatscreen DVD players that run on 12V. Some of these players include the necessary hardware to temporarily attach them to a headrest, and others require a third party holder or carrier. The main benefit of this type of car headrest DVD player is that it is tremendously portable, while the main drawback is aesthetic in nature. Regardless of whether a headrest DVD player is a plug-and-play or not, some level of wiring is required. Since completely self-contained systems include an LCD screen, DVD player, and either speakers or an audio output, the only necessary wiring involves hooking up a power source. Integrated headrest DVD players can be tied into other video and audio sources, so they require additional wiring. Some of these units can be hooked into a DVD head unit, which allows everyone in the vehicle to watch the same movie or TV show. Since they also include their own DVD players, each person can also choose to watch his or her own program. The most important feature for a headrest DVD player to have is some type of headphone support. Some units have an output jack that headphones can be hooked up to, and others offer some type of wireless functionality. The three main types of wireless headphones use Bluetooth, infrared, or RF to connect. Since these technologies aren’t compatible with each other, it’s important to buy the right type of ​in-car headphones after choosing a headrest DVD player. Headrest LDCs are a cheaper alternative to headrest DVD players. These units don’t include built-in DVD players, so they have to be hooked up to some type of external video source. Some paired units include one DVD headrest and one DVD-less LCD headrest. 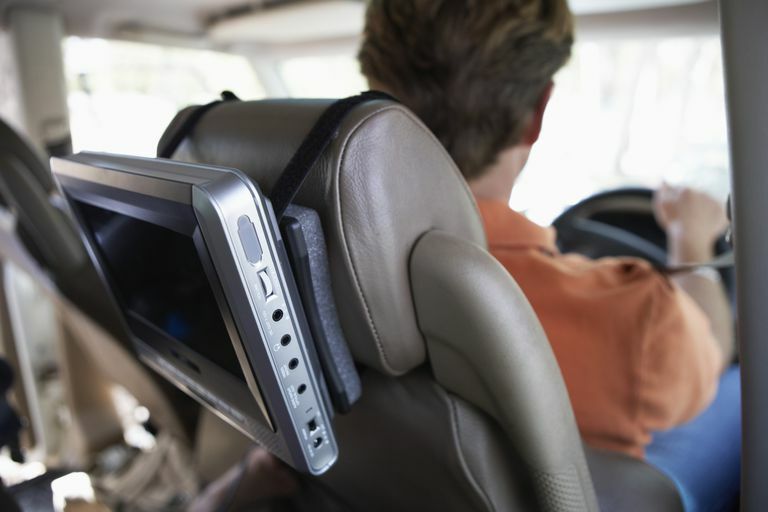 With the increasing popularity of iPads and other tablet computers, these highly portable devices have become a viable way to watch video content in a vehicle. While you can’t watch DVDs on a tablet, there are plenty of other ways to take your movies and TV shows on the road. With a tablet car mount and a wireless media server, the entertainment options are endless.